I have just finished working on a biomedicine summer school with staff from the Faculty of Medicine at Imperial College London. It was an illuminating experience. I was encouraged to see how well the principles of Live, Love, Learn could be applied in a different context and I improved my understanding of our potential to collaborate in more discrete disciplinary settings. The Revolutions in Biomedicine Summer School is attended by students from all around the world. It offers a series of activities within a programme of study related to biomedicine. This year, in collaboration with biomedical scientists, we designed sessions that employed our active modes of learning. These were the opening sessions of the 2018 Summer School and they were designed through discussions with the School’s convenors that ensured they aligned with the broader programme. 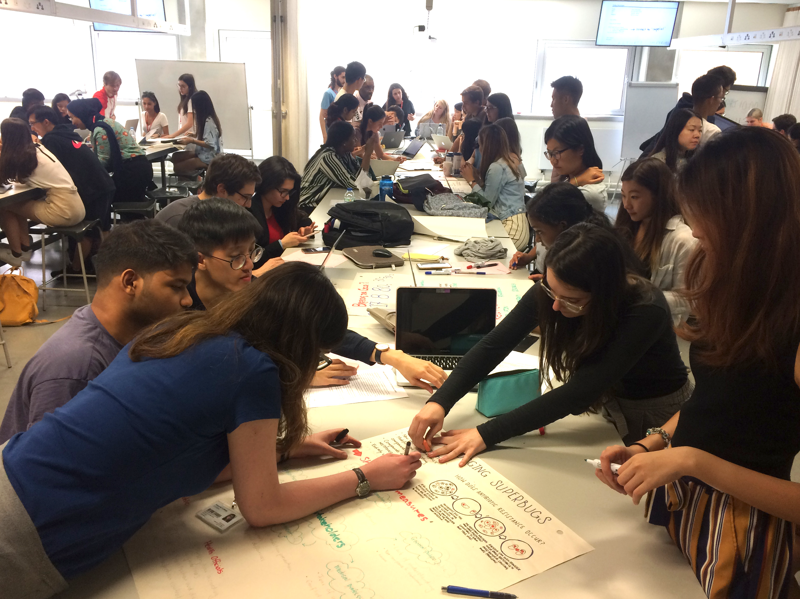 The sessions were entitled ‘Keeping it Real: Controversies and False Leads in Biomedicine’ and we asked students to work in teams to research controversial topics related to biomedicine. This required students to assess the wider discourse surrounding the controversies, and therefore to consider non-scientific aspects. In line with the Live, Love, Learn approach, the research-based format gave students the freedom to choose their own lines of investigation and draw on their diverse backgrounds and academic experience. We worked hard with the biomedicine team to carefully design research briefs for students that contained a sufficient amount of structure, whilst also allowing space for them to make key choices. Students appeared to enjoy this and researched a variety of topics including brain-computer interfaces, anti-microbial resistance and the use of cannabis oil for medicinal purposes. On our regular modules, we always aim to be responsive to student needs and choices. On this course, where students could explore any aspect of their chosen topic, but could also delve relatively deeply into the biomedicine, we needed to be particularly responsive during the sessions. Unlike the modules on which I usually teach, here there was a universal interest in one particular discipline. Therefore, there was a greater need to push for broader considerations, i.e. of the social, political or environmental context, where relevant. Such an interdisciplinary team-based research task was a big challenge for students at the start of their course, but it was one that stimulated them and that they rose to well. The projects culminated in a poster conference where students discussed their work. Students voted for their favourite poster and a poster entitled ‘Who owns my genome?” was voted to be the best. Notably this topic was an original one suggested by the students themselves, further underlining the benefits of students choosing their focus of study. The use of active and interactive tasks stimulated a great deal of discussion and peer-learning. It was a great way to start the school and by asking students to place biomedicine in its social context, it set a context for their broader programme of study. In the subsequent sessions, students went on to apply the team working, research and communication skills that they had developed here. For me, these sessions emphasised the potential value of interdisciplinary educational collaborations and the importance of good communications, responsiveness and flexibility, amongst the educators and students alike.